I remember the first time I tasted Jadot’s 2009 Beaune 1er Cru 150th Anniversary several years ago. An assemblage of numerous Beaune climats, the 150th Anniversary was incredibly expressive and flat-out delicious from the very beginning. Not surprisingly, Jadot subsequently decided to bottle the wine (now called Celebration) in top vintages. The 2015 is the latest release, and a worthy successor to both the 2012 and 2009. 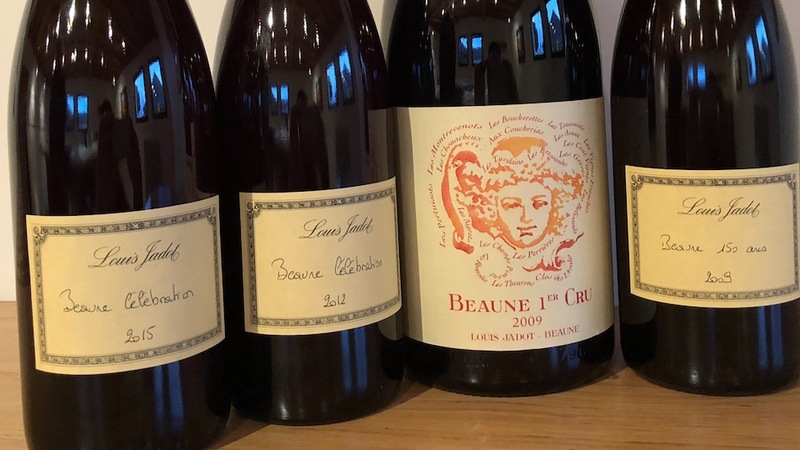 Winemaker Frédéric Barnier opts for a longer period of élevage for the Beaune 1er Cru Celebration than he does for the other Jadot reds, which is why the Celebration is only being released now. Wines from the single climats are aged for about eighteen months. Some are bottled separately, while others go into various blends. In top vintages, Jadot releases a blend of the best climats as the Beaune 1er Cru Celebration, which is the present day successor to a wine Jadot first made to celebrate their 150th anniversary, as explained above. The Celebration lots spend eighteen months in barrel. Barnier creates the blend and then gives the wine a further six months in tank to allow all the components to meld together prior to bottling. Production is around 5,000 cases for the 2015. The 2015 Beaune 1er Cru Celebration is a rich, radiant wine. Sumptuous and expansive on the palate, the 2015 possesses striking inner perfume and fabulous depth. The flavors are dark, bold and incisive in this decidedly potent, somber Beaune 1er Cru from Jadot. Even with all of its natural richness, the 2015 is massively tannic and shut down. I wouldn’t dream of opening a bottle anytime soon. The combination of 19 climats results in a Beaune of unusual complexity and pedigree, but readers will have to be patient. The 2015 was only bottled in December 2017. 93+/2030-2055. Jadot’s 2012 Beaune 1er Cru Celebration is aromatically quite expressive, with lovely bright, floral notes that play off a core of red berry and stone fruits. The gracious, almost feminine, bouquet is alluring and suggests a wine that is quite open, but the palate sensation is completely different. Tiny yields and high skin to juice ratios yielded red Burgundies with huge tannic clout that obscures the fruit, which is exactly how the wine comes across in tasting. It will be interesting to see if the 2012 softens over time, or if it gains volume with aging. Today, it is decidedly on the austere side of things. 92/Drink 2024-2049. The 2009 Beaune 1er Cru 150th Anniversary is every bit as magical as it has always been. There is a translucence to the fruit that is just remarkable. That is the good news. The not so good news is that the 2009 remains very tightly wound and in need of further cellaring. The aromatics are just starting to open up, but the tannins remain quite fierce. Readers who own the 2009 should be prepared to cellar it for at least a few years. There is an effortlessness to the 2009 that is hard to describe, but that gives the wine its sense of impeccable balance. Hints of sweet pipe tobacco, cedar, dried herbs and cherry add the closing shades of aromatic nuance to this gorgeous, compelling Beaune from Jadot. The 2009 is a blend of 17 different sites. 94/Drink 2024-2059.